This is a two hour tour. You can’t get any closer to nature while you meet your wild side driving our All-Terrain Vehicles. Monkeys, Birds, Snakes are some of the animal species you might see. 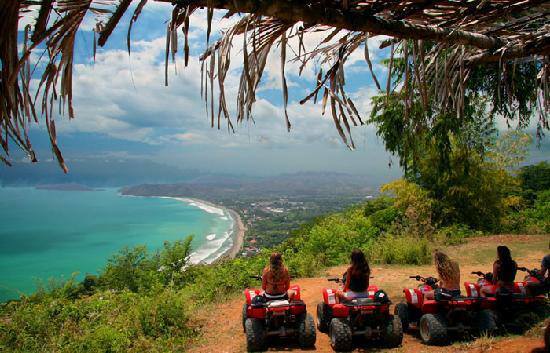 Creeks, jungle, beaches and mountain are the perfect portrait you will have in your memory. Is that not enough Adrenalin for you? * Children under 6 years of age with an adult are free of charge. *** For an additional $45 you can combine ATV with Zip lining (Canopy) Departure Times for ATV/Zip lining (Canopy) upon request. **** Add $10 per person J.W. Marriott, Westin Conchal, Flamingo, Playa Grande. Anytime between 8:30 am and 3 pm. Includes pick up and drop off at your hotel / house. Light clothing, tennis shoes, sunglasses, sun block and swimsuit are recommended.